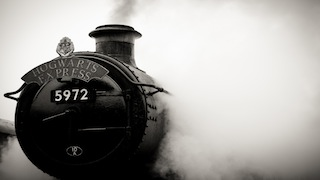 As Harry Potter heads off into his happily ever after, the Hogwarts Express, which transported millions to the magical world of Hogwarts, is getting shipped to Britain's National Railway Museum in York, where the cherry red locomotive will go on permanent display. The Daily Mail reports that the train has had a remarkable journey. The nearly 80-year-old Olton Hall steam engine was scheduled to be recycled (repurposed as razor blades) before it was sighted by a Hollywood locomotive talent scout. Engine no. 5972, which still works, was last spotted being pulled across northern Yorkshire by a more modern train, apparently heading for retirement. The train had previously transported some lucky muggles, but a regular route was unfortunately not in the works. So long platform 9 3/4.